The children use white glue and aluminum foil to create prints with positive and negative lines. For ages 9 to 13. Plan 3 sessions. Adjust the caps on the glue bottles to get a thin flow of glue. Set out bottles of glue, cardboard, and pencils. Cover work area with newspaper. 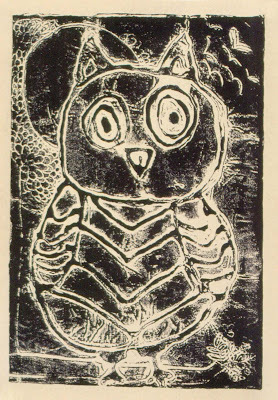 The children will experience two different approaches in preparing printing plates which are used to transfer images to paper. In this session positive, or raised, lines will be made with white glue. Explain that when printing ink is rolled over the printing plate the protruding glue lines will get ink on them, so when the print is made the lines will be the color of the ink. In the next session the children will be covering the printing plates with aluminum foil and pressing lines into the foil. This will create negative lines that will not get ink on them and will be the color of the paper when a print is made. 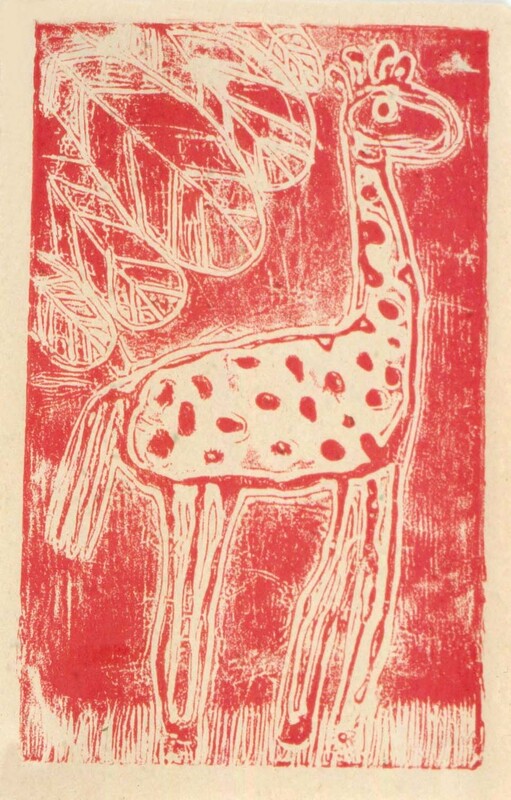 Both of these processes are referred to as relief printing. 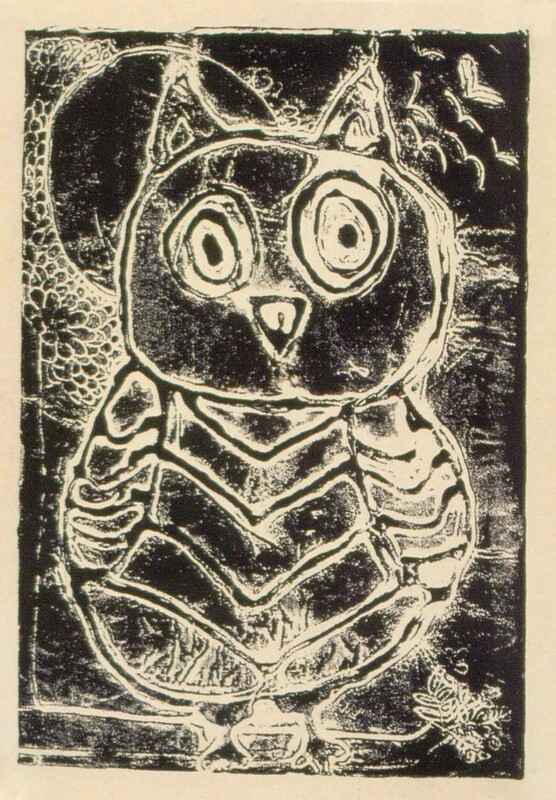 Demonstrate how to draw on the printing plate with the white glue. Start by making a guideline with pencil, filling the cardboard with a drawing of a single animal or object. Explain that the thickness of the glue line will make small details disappear, so they will be added in the next session when working with the aluminum foil. Apply the glue by trailing along the lines, gently squeezing the container with the nozzle against the cardboard. Moving the bottle too quickly along the lines will cause the glue to skip and moving too slowly will cause the glue to puddle. 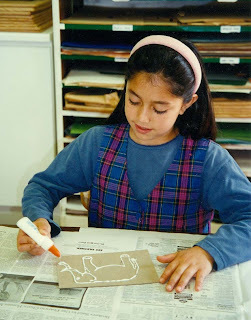 After the children practice making glue lines on pieces of scrap paper, have them draw an animal or object on the cardboard with pencil, and then follow the lines with the white glue. Remind them to keep the cardboard flat so the wet glue lines will not run. Note: The glue needs to dry overnight before using the plates for printing. Cut aluminum foil into pieces slightly larger that the cardboard. Set out printing plates, cut foil, masking tape, and pencils. Set out small dishes of glue with brushes. 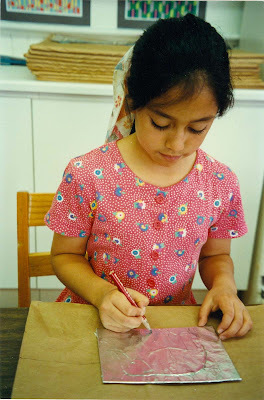 In this session, the children will be gluing aluminum foil to their printing plates and drawing details and backgrounds into the foil while the glue is still wet. Demonstrate how to apply the aluminum foil. Brush the glue over the entire surface of the printing plate, smoothing any lumps or puddles. With the shiny side facing up, stretch the aluminum foil over the wet glue, pressing it down firmly, starting from the center and working out to the edges of the printing plate. It’s important to press over the entire surface so that all areas of the foil will adhere to the printing plate. Fold and tape the extra foil to the back of the printing plate. Using a blunt-pointed pencil, carefully indent the foil on both sides of the glue lines, working slowly so the foil doesn’t tear. Then add details and backgrounds by drawing into the foil. Encourage the children to fill the printing plates with lots of patterns and textures, such as leaves on trees, veins in leaves, and blades of grass. 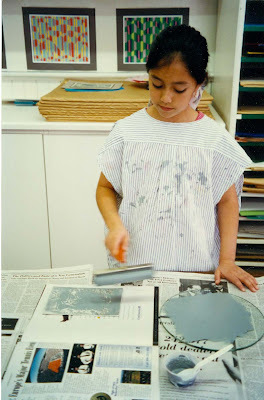 Have the children glue the foil onto the printing plates and complete their drawings while the glue is still wet. Prepare one or more printing stations. Each station should be covered with newspaper and include a magazine, an ink tray, a brayer, printing ink, and printing paper. Set aside a clean area for rubbing and pulling the prints. Plan space to dry the prints as they are pulled. Set out the prepared printing plates. In this session the children will be applying printing ink to their printing plates to make relief prints. Demonstrate the printing process by first placing the printing plate on a magazine. Explain that after the ink is applied, the page can be turned to give the next child a clean working surface. Squeeze about an inch of ink onto the ink tray. Use the brayer, or roller, to spread the ink in several directions. Be sure the children understand that the intention is to have the ink evenly distributed on the brayer rather than the ink tray. 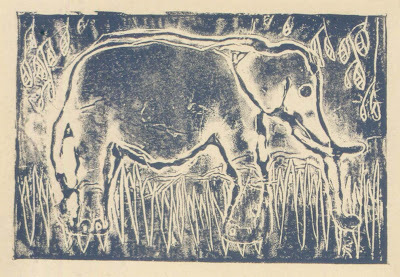 Using strong pressure, roll the inked brayer firmly over the printing plate several times. Refill the brayer by rolling it across the ink tray again. Then roll the brayer over the printing plate in another direction. Repeat this several times, pressing firmly, until enough ink has been transferred from the ink tray and is evenly distributed on the printing plate. To pull a print, place the printing plate on a clean surface with the inked side up. Lay a piece of paper on top of the plate. While holding the paper in place with one hand, use the other hand to rub firmly with the soft part of the finger tips. Be sure to rub the entire surface. Tell the children that an important characteristic of a quality print is its sharp, crisp edges. They should rub around all the edges very carefully. Holding one side of the print with one hand, lift up the other side to see if enough ink has been transferred to the paper. If not, let the paper drop and continue rubbing. When finished, gently pull the paper from the printing plate. Have the children spend the rest of the session making as many prints as time allows. Whenever demonstrating a process, use a subject different from the one that the children will be using. This will allow the children to think freely and not be inhibited by your ideas and interpretations. It is difficult to apply the glue lines evenly, but the resulting variations in thickness add interest to the final print. If necessary, puddles can be spread by pulling a toothpick through them. The shiny side of the aluminum foil is non-stick, so it is important to glue the dull side of the foil to the printing plate. If you glue the shiny side down, the print will not work because the non-stick foil will pull away from the printing plate when the ink is rolled across it. A proper amount of ink on the ink tray will sound tacky when rolling the brayer across it. If the sound is smooth or slimy, there is too much ink which will clog the fine lines in the aluminum foil. Therefore, it is best to have an adult refill the ink on the ink trays. Because of the raised glue line, extra pressure is needed when rolling the ink on the printing plate and care must be taken to rub the complete surface before pulling the print. If time permits, show the children how a finished print is numbered. The number of the impression is placed over the total number of prints made. For example, the first print pulled out of five prints would be 1/5; the second print pulled would be 2/5 and so on. This is written in pencil on the right hand side under the print. The artist’s name appears on the left hand side under the print, also in pencil. Is the ink distributed evenly on each print? Are the edges of the prints sharp and crisp? Discuss the positive and negative lines in the prints. I can’t get my glue bottle to work. There are blobs of glue all over. I pushed too hard with my pencil and the aluminum foil ripped. How much background do I need to draw? I like the sound that the brayer makes when rolling it in the ink. My print came out smeared. When applying the glue remember to adjust how hard you squeeze. Although some puddles will not hurt your print, you can drag a toothpick through them to spread the glue. Be sure your pencil has a very blunt point so it won’t rip the foil. A few small tears won’t hurt as long as you have glued the foil very securely to the printing plate. 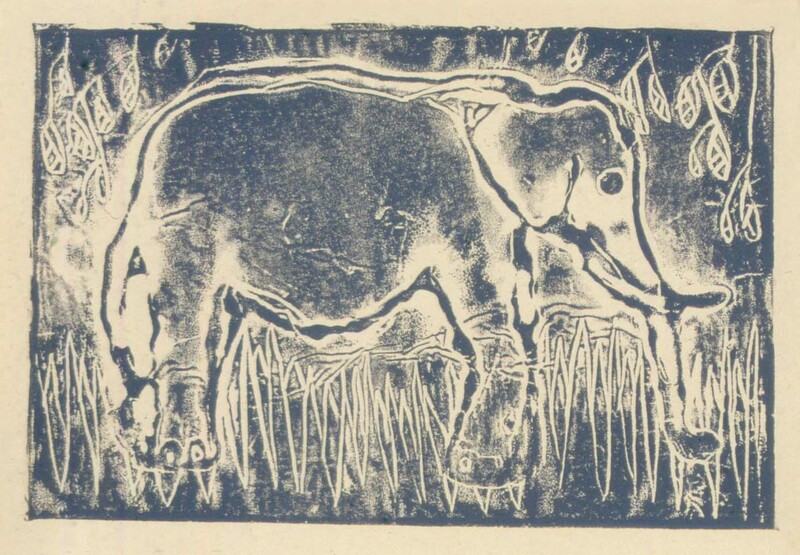 Your print will be more successful if you fill your printing plate with details and textures. That tacky sound tells us that the proper amount of ink is on the ink tray. If the sound becomes slimy, we will need to remove some of the ink. When you make your print, be sure to use one hand to hold the paper in place while you rub with the other hand.